Kitchen + Bath Designs Go Green for St. Patrick’s Day 2019! – Design Your Lifestyle. Kitchen + Bath Designs Go Green for St. Patrick’s Day 2019! Go Green With Your Designs On St. Patrick’s Day 2019! Any day is a good day to “green” your living space – but if you need a festive excuse, look no further than St. Patrick’s Day! The most famous of Irish holidays, St. Patrick’s Day is a wonderful time to get inspired by the green shades, tones and design elements that are trending in 2019. We’re sure you’re expecting the usual fare in this article – shamrocks, green throw pillows and drapes, etc. Fear not – we’re bringing you something different! What are the Pantone Spring 2019 green colors? 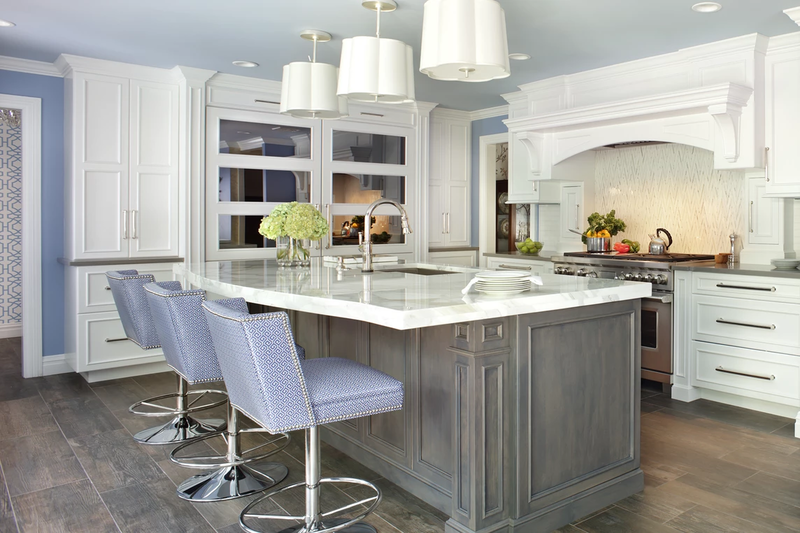 How can you incorporate fresh greens and florals in a new and interesting way in your kitchen design? This article will help you answer those questions. Of course, we should already be “going green” with as many design choices as possible, in an effort to reduce our carbon footprint and become more environmentally conscious. So in terms of this St. Patrick’s Day, we’re taking the idea of “going green” a bit more literally. Green isn’t the simplest color choice to use in a kitchen or bath design in 2019. With color design trending more and more towards neutral and white tones, it’s often hard to find a place for green as more than a complementary color. But is that really a problem? Utilized properly, a complementary green tone in your design can create quite the impression. Let’s take a look at the official Pantone green tones of Spring 2019, and a few “outside the box” design ideas to add a splash of green this spring. Deep, earthy and rich, Terrarium Moss is a steady dark green Pantone color that pairs nicely with light neutrals, earth tones and blues. Pepper Stem is a lively, inviting Pantone green that works beautifully in designs that feature plenty of ambient light, whites and off-whites, and plant and floral elements. 1. Use deep greens to add a luxurious tone to wood-heavy designs. 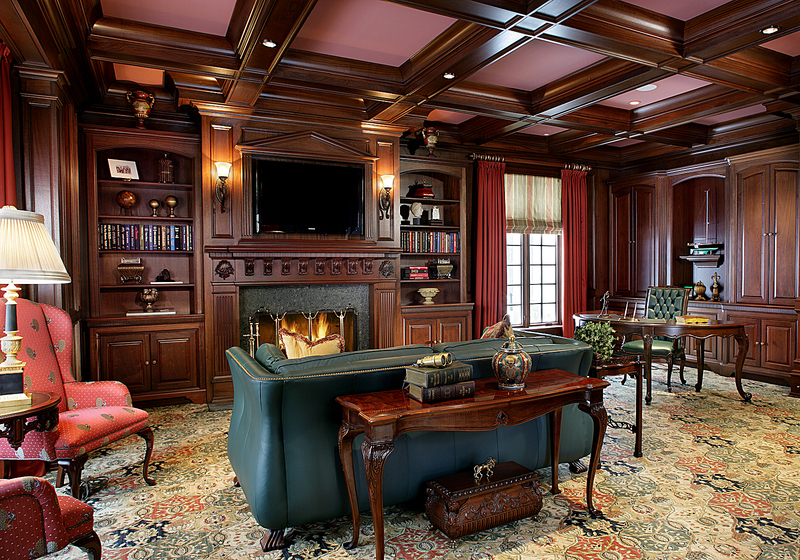 Dark green decor adds a luxurious touch to rich wood features in this sitting room from Peter Salerno Inc.
2. 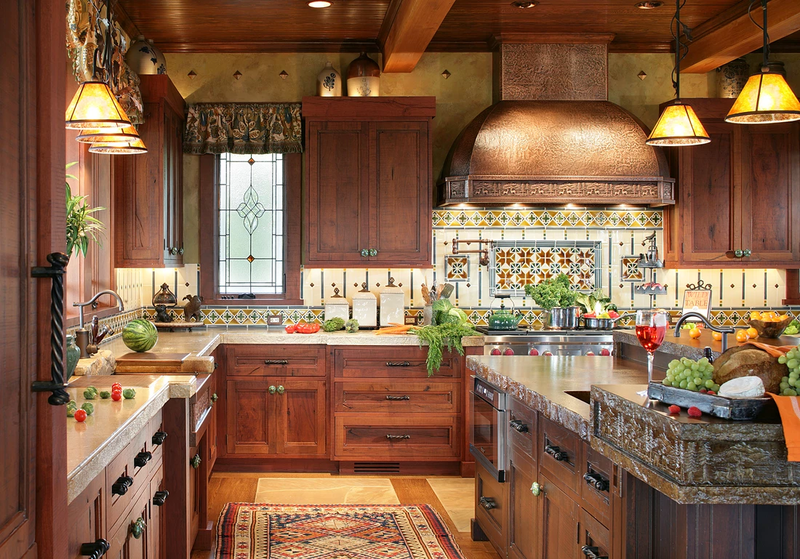 Fresh greens, foliage and florals bring even more sunshine into a bright kitchen design. Touches of greenery and florals freshen up an already bright kitchen. Use fresh vegetables as design elements in your kitchen before they’re ready to eat.